I've already raved many times about how much I love Lush Cosmetics before so I'll spare you from that in this post haha. I've tried what I'd like to think a good amount of products from Lush ranging from bath to skin care. When I started to get a lot more into the brand it started off with me buying bath bombs for the occasional relaxing pamper nights and it's now a passion of mine. Every time I'm inside one of my local malls that carries a Lush inside it's now routine to walk inside and browse at the endless amount of things. Even if I'm only 'window shopping' its habit to stop inside to take a peek. I love how every single product of theirs is made with all natural ingredients, everything is cruelty-free and most of their products are vegan. Today I am going to begin sharing some of my favorite Lush products. Some of these products may look familiar to you since most if not all have previously been on a monthly favorite. I have quite a few favorites so I'm going to be breaking them up into separate posts and for today's post I'm going to be sharing some of my favorite black pot products. First up is also the first skin care product I ever tried from Lush and it is Dark Angles face and body cleanser. This cleanser has been a favorite of mine for almost a year now and was even in monthly favorites from early 2016. I love this cleanser and was out of it for a while. I finally repurchased it and I'm now using it every other day in my night time routine along with my Clarisonic. I enjoy that Dark Angles is a gentle exfoliator and that it contains charcoal. It is ideal for those of us who have and oily acne-prone skin. The charcoal in this absorbs any excess oils on the skin. It also contains rhassoul mud that goes deep into the skin cleansing it to prevent break outs. Once you're all done cleansing your face with Dark Angles you will notice how soft it left your skin and that is all thanks to the avocado oils that nourishes and lightly hydrates the skin. You can use this cleanser on your face or body as it says but I only used it for my face. This cleanser is also a favorite of Rudy's! 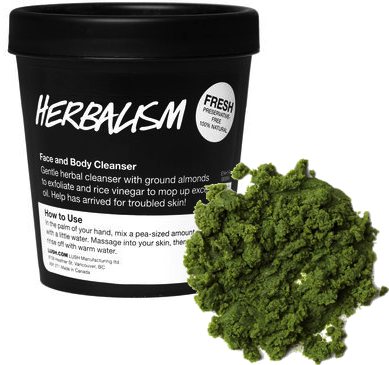 Second up for my favorites is the Herbalism face and body cleanser, another product I've previously talked about in a monthly favorite from last year. Herbalism is very similar to Dark Angels, they're both a light exfoliant and are targeted for oily acne-prone skin. This herbal wash contains kaolin clay and rice bran that will soak up all the excess oils. The vitamins and minerals inside Herbalism will balance your skins oil production to a more clear and balanced skin. When using this I have noticed myself how much it really does help my skin when I'm battling a breakout or two. Herbalism is also perfect for anyone who has very sensitive skin because it contains rose absolute and that helps soothe and calm your skin while you are cleansing it. I'm so happy that I decided to turn to Lush for a shaving product. 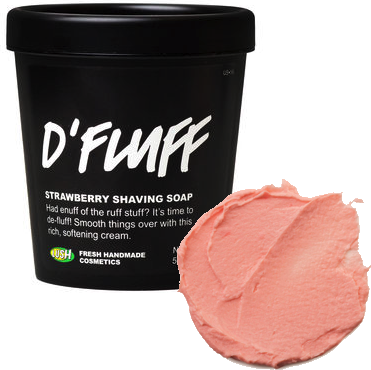 I have been using D'Fluff shaving soap since June and it quickly became a staple in my shaving routine. I think I've mentioned before on my blog that my legs get really sensitive when I shave often mainly in the warmer months. I get what I think is razor burn and usually on the sides of my calves little red bumps that look like a rash appear. It can be painful it mostly burns and it's not cute. Ever since I began using this it's done wonders to my legs. It's definitely helped prevent that irritation I get with shaving frequently and leaves my skin feeling moisturized. This shaving soap contains roseship oil, cocoa butter, and coconut butter. I am able to shave twice a week without any worries and pain-free. The consistency of D'Fluff is different because it's whipped and you also don't need a lot of this. I like using this to shave my arms and even armpits. Sometimes my armpits get a little sensitive when shaving and this always helps prevent it. In the Summer I can get really sensitive skin if I'm shaving a lot. Then comes winter my body now gets dry due to the cold. I tried Lush's Snow Fairy body container (this one is limited edition) for the first time early January and fell in love instantly. I used this on my legs right after I was done shaving my legs just to give it some extra hydration. When I was all done and dried myself off my legs felt velvety smooth. I used it a few times on my body and it worked just as great and I didn't even have to apply any lotion to myself afterward because this alone did a great job with that. A few weeks ago I picked up Ro's Argan body condition to also give a try and I also love it. I find that Snow Fairy is a little more greasy but for winter time I'm totally ok with that. That feeling goes away once you rinse and dry off. 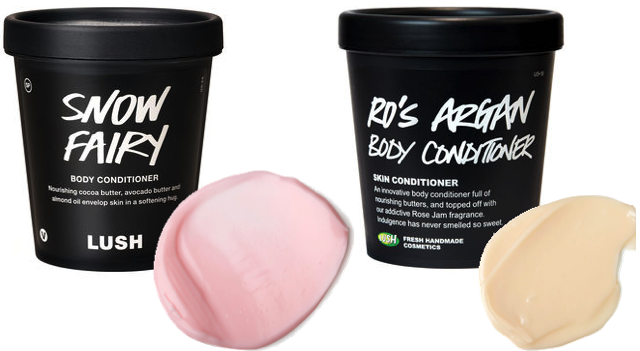 These body conditioners are jam packed cocoa, argan, and shea oils for that deep hydration. I've been enjoying this product on my legs and I know it will also be a staple in my shaving routine come summer time. I need anything and everything to keep those irritated bumps away. 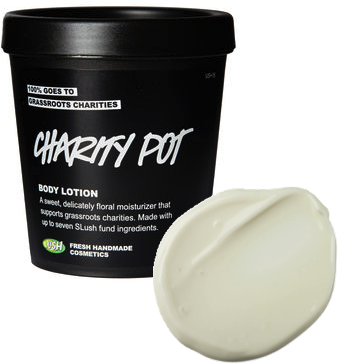 The last product I am going to talk about today is the Charity Pot body lotion. I am not a huge fan of greasy lotions and am incredibly picky with them. This lotion is amazing and leaves my skin ridiculously soft. This is the only lotion I have used from Lush, and it is definitely my favorite body lotion of all time. When I was first introduced to this in a Lush store I was like nope no way because it was very greasy. After a while, that greasiness faded and it left my skin the softest it's ever been. I took home a sample, loved it, and a week later purchased a large pot. I'm currently on pot number two and trust me when I say a little of this goes a long way! Charity Pot contains rosewood oils with hydrating cocoa butter. It is ideal for sensitive and/or irritated skin. I love applying this all over my body but especially on my legs once I am finished shaving. It really helps soothe my skin while preventing any irritation since I've mentioned my legs are extremely sensitive with shaving. I also love applying this on my tattoos because it helps brighten up the colors. The scent is very faint but smells very clean and fresh. An amazing fact about Charity Pot and love is that with every purchase of this lotion 100% of proceeds will go to a small grassroots organization. Go Lush! I hope you enjoyed reading about some of my favorite Lush products. I'd love to know what are some of your favorites you think I should try out? I love dark angels cleanser its my favorite. I use this all the time I love how it makes my skin feel. It's such a good cleaner. I love that it has charcoal in it. You'll love it and will never want to go back to regular shaving creams. They have a lot of things I had no idea about. I really need to buy that D'Fluff soon to shave my legs since we are having nice weather. It's so good, I think I want to try out a different shaving cream next time. Explore the waters haha.